The Book of Shadows, or BOS, is used to store information you'll need in your magical tradition, whatever it may be. Many Pagans feel a BOS should be handwritten, but as technology progresses, some use their computer to store information as well. Don't let anyone tell you there's only one way to make your BOS, because you should use what works best for you! Bear in mind that a BOS is considered a sacred tool, which means it is an item of power that should be consecrated with all of your other magical tools. In many traditions, it is believed you should copy spells and rituals into your BOS by hand; this not only transfers energy to the writer, but it also helps you to memorize the contents. Make sure you write legibly enough that you’ll be able to read your notes during a ritual! 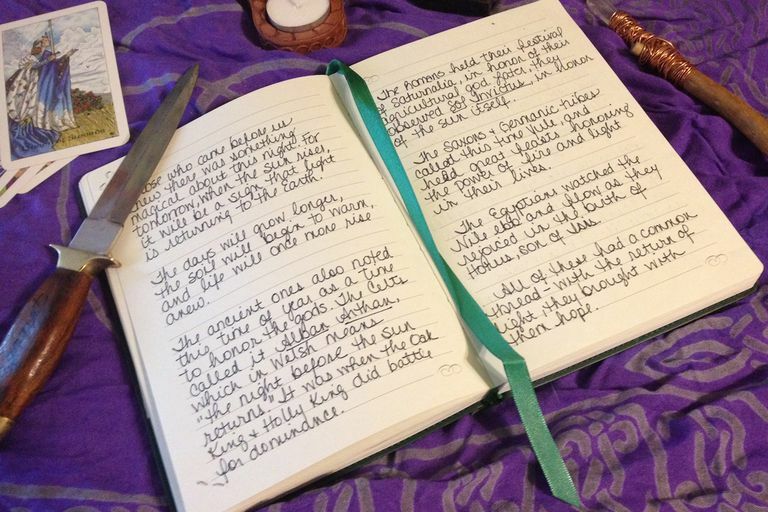 To make your Book of Shadows, begin with a blank notebook. A popular method is to use a three-ring binder so items can be added and rearranged as needed. If you use this style of BOS, you can use sheet protectors as well, which is great for preventing candle wax and other ritual drippings from getting on the pages! Whatever you select, your title page should include your name. Make it fancy or simple, depending on your preference, but remember that the BOS is a magical object and should be treated accordingly. Many witches simply write, “The Book of Shadows of [your name]” on the front page. What format should you use? Some witches are known to create elaborate Books of Shadows in secret, magical alphabets. Unless you’re fluent enough in one of these systems that you can read it without having to check notes or a chart, stick with your native language. While a spell looks beautiful written out in flowing Elvish script or Klingon lettering, the fact is that it’s just hard to read unless you’re an Elf or a Klingon. The biggest dilemma with any Book of Shadows is how to keep it organized. You can use tabbed dividers, create an index at the back, or if you’re really super-organized, a table of contents in the front. As you study and learn more, you’ll have more information to include, which is why the three-ring binder is such a practical idea. Some people choose instead to use a simple bound notebook, and just add to the back of it as they discover new items. If you find a rite, spell or piece of information somewhere else, be sure to note down the source. It will help you keep things straight in the future, and you'll start to recognize patterns in authors' works. You may also want to add a section that includes books you've read, as well as what you thought of them. This way, when you get a chance to share information with others, you'll remember what you've read. Keep in mind that as our technology is constantly changing, the way we use it does too. There are plenty of people who keep their BOS completely digitally on a flash drive, their laptop, or even stored virtually to be accessed by their favorite mobile device. A BOS pulled up on a smartphone is no less valid than one copied by hand in ink onto parchment. You may want to use one notebook for information copied from books or downloaded off the Internet, and another for original creations. Regardless, find the method that works best for you, and take good care of your Book of Shadows. After all, it’s a sacred object and should be treated accordingly. When it comes to the contents of your personal BOS, there are a few sections that are nearly universally included. Laws of Your Coven or Tradition: Believe it or not, magic has rules. While they may vary from group to group, it’s a really good idea to keep them at the front of your BOS as a reminder of what constitutes acceptable behavior and what doesn’t. If you’re part of an eclectic tradition that doesn’t have written rules, or if you’re a solitary witch, this is a good place to write down what you think are acceptable rules of magic. After all, if you don’t set yourself some guidelines, how will you know when you’ve crossed over them? This may include a variation on the Wiccan Rede, or some similar concept. Gods and Goddesses: Depending on what pantheon or tradition you follow, you may have a single God and Goddess, or a number of them. Your BOS is a good place to keep legends and myths and even artwork concerning your Deity. If your practice is an eclectic blend of different spiritual paths, it’s a good idea to include that here. Correspondence Tables: When it comes to spellcasting, correspondence tables are some of your most important tools. Phases of the moon, herbs, stones and crystals, colors – all have different meanings and purposes. Keeping a chart of some sort in your BOS guarantees that this information will be at the ready when you really need it. If you have access to a good almanac, it’s not a bad idea to record a years’ worth of moon phases by date in your BOS. Also, put together a section in your BOS for herbs and their uses. Ask any experienced Pagan or Wiccan about a specific herb, and chances are good that they’ll expound on not only the magical uses of the plant but also the healing properties and history of use. Herbalism is often considered the core of spellcasting because plants are an ingredient that people have used for literally thousands of years. Remember, many herbs should not be ingested, so it’s important to research thoroughly before you take anything internally. Sabbats, Esbats, and Other Rituals: The Wheel of the Year includes eight holidays for most Wiccans and Pagans, although some traditions do not celebrate all of them. Your BOS can include rituals for each of the Sabbats. For example, for Samhain, you may wish to create a rite that honors your ancestors and celebrates the end of the harvest, while for Yule you may want to write down a celebration of the Winter Solstice. A Sabbat celebration can be as simple or complex as you wish. If you’ll be celebrating each full moon, you’ll want to include an Esbat rite in your BOS. You can use the same one each month, or create several different ones tailored to the time of year. You may also wish to include sections on how to cast a circle and Drawing Down the Moon, a rite that celebrates the invoking of the Goddess at the time of the full moon. If you’ll be doing any rites for healing, prosperity, protection, or other purposes, be sure to include them here. Divination: If you’re learning about Tarot, scrying, astrology, or any other form of divination, keep information in here. When you experiment with new methods of divination, keep a record of what you do and the results you see in your Book of Shadows. Sacred Texts: While it’s fun to have a bunch of new shiny books on Wicca and Paganism to read, sometimes it’s just as nice to have information that’s a little more established. If there is a certain text that appeals to you, such as The Charge of the Goddess, an old prayer in an archaic language, or a particular chant that moves you, include it in your Book of Shadows. Magical Recipes: There’s a lot to be said for “kitchen witchery,” because for many people, the kitchen is the center of hearth and home. As you collect recipes for oils, incense, or herb blends, keep them in your BOS. You may even want to include a section of food recipes for Sabbat celebrations. Spell Crafting: Some people prefer to keep their spells in a separate book called a grimoire, but you can also keep them in your Book of Shadows. It’s easier to keep spells organized if you divide them up by purpose: prosperity, protection, healing, etc. With each spell you include, particularly if you write your own rather than using someone else's ideas, make sure you also leave room to include information on when the working was performed and what the outcome was. We're all on the go pretty much constantly, and if you're someone who prefers to have your BOS immediately accessible and editable at any time, you might want to consider a digital BOS. If you choose to go this route, there are a number of different apps you can use that will make the organization easier. If you've got access to a tablet, laptop, or phone, you can absolutely make a digital Book of Shadows! Use apps like Microsoft's OneNote or Google Drive to organize and create simple text documents and folders; you can even share documents with friends and coven members. If you want to make your BOS a bit more like a diary or journal, check out apps like Diaro. If you're graphically inclined and artsy, Publisher works well too. Do you want to share your BOS with others? Consider putting together a Pinterest board with all of your favorite content!